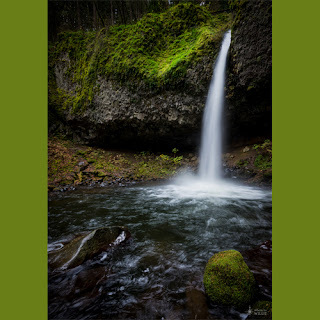 Horsetail Falls, or as some would call it Ponytail Falls is an exciting waterfall to visit in the Columbia River Gorge. If you take the Horsetail Falls Loop Hike you'll be surprised to find you've travel 2.6 miles due to the distracting beauty and the child-like wonder people of all ages can experience while traveling along this trail. It may be crowed on nice days but it's family friendly and the difficulty level is considered easy. You'll want to walk behind Horsetail Falls while your here just because you can. Read more about locating this Columbia Gorge waterfall below. The trail begins in one of the most scenic trailheads anywhere, at Horsetail Falls. Plan on a bit of time before or after you hike to view and photograph the falls. Horsetail Falls Trail #438 begins climbing some easily graded switchbacks with beautiful rock walls. You'll pass your first trail junction here, as Gorge Trail #400 heads east. After 5 switchbacks the trail levels out, and heads west for a bit, high above the Gorge below. After 4/10 of a mile, the trail suddenly turns into the small valley containing Ponytail Falls. In literally a few steps, you leave the modern freeway noise and enter a different world. The trail passes behind Ponytail Falls in a cavernous area eroded beneath a lava flow.